Keep smells at bay. 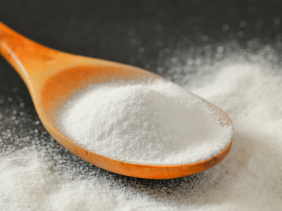 To keep your fridge or cupboard fresh, leave a small, open bowl of bicarbonate of soda inside. Or sprinkle some at the bottom of your kitchen dustbin and it will keep bad smells away. Cleani acid-sensitive surfaces like granite or marble. This is a great alternative if you want a natural cleaner but can't use lemon juice and vinegar, which can corrode some surfaces. Make a paste by mixing with a little water, then rub onto your surface.